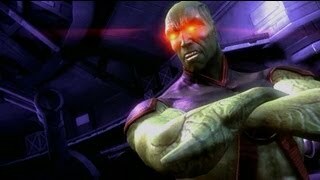 Martian Manhunter has arrived in Injustice: Gods Among Us. Get the lowdown on how much the DC Comics character will cost you inside. Injustice: Gods Among Us now has a new character. Martian Manhunter is now downloadable on Xbox Live for 400 Microsoft Points along with a free Green Lantern John Stewart skin (no DLC purchase required). The DC Comics hero is also available on PSN for $5 with the free Stewart skin. NOTE: Updated to include PSN release.